Prison Chaplain: Sr Dolores Donnelly (centre) at the welcoming of Sr Bev Whitton (left). 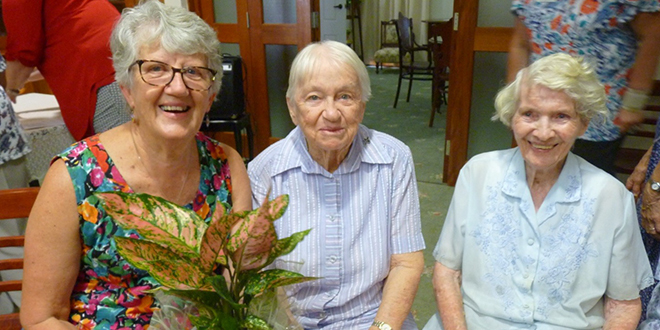 MERCY Sister Dolores Donnelly recently retired after 20 years serving as one of a dedicated team of people who regularly visits the Capricornia Correctional Centre. She was part of the Catholic chaplains, an integral part a multi-denominational team of chaplains who seek to bring caring support to all affected by the destructive cycle of crime. “I really loved doing the job, and I miss it really,” Sr Donnelly (pictured) said. She was forced to stop for health reasons after having a fall, but she said it was rewarding work. “We usually go one day a week and we spend the day going around to different parts of the prison and speaking to the prisoners, or maybe they want to ask you about something, or something that needs to be prayed about,” Sr Donnelly said. “They might ask you to say a prayer. “It might just be to contact their family about something. The chaplains minister to the Capricornia Correctional Centre residents, their family members and the staff. Together they conduct prayer services and Bible study; celebrate Mass and sacraments, transport families; conduct memorial services; and make personal visits to the families of inmates. In their days away from the prison, the small team maintains contact with families and friends of inmates, who are often in need of financial, physical, emotional and spiritual support. They provide transport to and from the prison for families and friends of inmates, and maintain a house for the accommodation of out-of-town visitors to the prison. They also keep in contact with many of the men and their families once they have been released from prison. Sr Donnelly came from humble beginnings. She was born and raised in Mackay, and she undertook teacher training in Brisbane before returning to teach at Farleigh State School. She became a Mercy Sister on December 14, 1958, and continued to teach in many of the Catholic schools in the region. She was awarded a Queensland Catholic Education Commission Catholic Education Award for her service. In 1997, Sr Donnelly joined the prison ministry, becoming a weekly visitor with Sr Ursula Brown. When Sr Brown retired in March 2002, Sr Donnelly continued her efforts to assist those in prison. Although Catholic Prison Ministry is a diocesan-funded initiative, the Sisters of Mercy give great support in various ways. There are many people in the community who know and appreciate the 20 years of service Sr Donnelly has given to those whose lives have taken a wrong turn.